Yusuf al-Qaradawi, an influential Muslim Brotherhood theologian, promises to be in Egypt's Tahrir Square to deliver a sermon at Friday's prayer service. Qaradawi, who has lived in Qatar since 1961, was a vocal critic of deposed Egyptian President Hosni Mubarak. A profile this week in Germany's Der Spiegel called him the Muslim Brotherhood's "father figure." But his return is being touted as a reward for "Qaradawi's role in mobilizing support for the Egyptian revolution," a claim which is questionable at best. 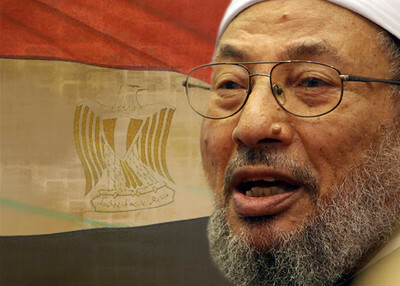 It won't be the first time Qaradawi has been back to Egypt, but his visits have been fleeting. A sermon from him on the first Friday after Mubarak's ouster could be hugely symbolic as the Brotherhood tries to exert influence over the direction Egyptian society takes. And it will trigger memories of the 1979 Iranian revolution, which took a dramatic turn when Ayatollah Ruhollah Khomeini returned from exile in France. Egypt's revolution has been described as largely spontaneous, fueled by a building rage brought on by years of oppression, inspired by a Facebook page created by Google executive Wael Ghonim devoted to a man killed by security forces and ignited by the peaceful Tunisian revolt, which showed change was possible. If anything, the Muslim Brotherhood deliberately took a low profile during the uprising, not wanting to play into Mubarak's narrative that his ouster would lead to chaos in Egypt. But a statement Monday from Qaradawi's International Union of Muslim Scholars said he "initiated the beginning of the Friday of wrath 28/01/2011 by shouting out loud, 'Go, Mubarak, safeguard the blood and protect the people of Egypt.'" The Brotherhood confirmed Qaradawi's role in Friday's events, saying he "will address the celebrators on the importance of the role of all Egyptians in building a free and democratic Egypt." The Der Spiegel profile notes Qaradawi's enigmatic nature. Hailed as a moderate for opposing al-Qaida and embracing modern technology, he has called on Allah to kill "the Jewish Zionists" and spoken "about the right of Palestinian women to blow themselves up." He has been barred from entering the U.S. since 1999, the profile said. Called on Muslims to acquire nuclear weapons "to terrorize their enemies." Called jihad an Islamic moral duty and said Muslims are permitted to kill Israeli women because they serve in the army. Affirmed his support for suicide bombings. "I supported martyrdom operations," he said, according to a translation by the Middle East Media Research Institute (MEMRI). "This is a necessary thing, as I told them in London. Give the Palestinians tanks, airplanes, and missiles, and they won't carry out martyrdom operations. They are forced to turn themselves into human bombs, in order to defend their land, their honor, and their homeland." Called the Holocaust a divine punishment of Jews "for their corruption. The last punishment was carried out by Hitler. By means of all the things he did to them - even though they exaggerated this issue - he managed to put them in their place. This was divine punishment for them. Allah willing, the next time will be at the hands of the believers." Prayed for the opportunity to kill a Jew before his death. "The only thing that I hope for is that as my life approaches its end, Allah will give me an opportunity to go to the land of Jihad and resistance, even if in a wheelchair. I will shoot Allah's enemies, the Jews, and they will throw a bomb at me, and thus, I will seal my life with martyrdom. Praise be to Allah." This week, a Brotherhood official was among eight people named to a panel charged with recommending changes to Egypt's suspended constitution. As the IPT has noted, the Brotherhood's bylaws continue to call for it "to establish Allah's law in the land by achieving the spiritual goals of Islam and the true religion." That includes "the need to work on establishing the Islamic State, which seeks to effectively implement the provisions of Islam and its teachings." Der Spiegel reports that Qaradawi envisions a "United Muslim Nations" as a contemporary form of the caliphate. In its statement on the Revolution, the International Union of Muslim Scholars advocated something much broader. It called for "all components of the Egyptian people, Muslims and Copts, alike to stand as one to reach a consultative democratic government which represents the Egyptian people and its values and principles." Images of a triumphant Qaradawi in leading prayer at the spot that triggered Egypt's revolution might trigger memories of Ayatollah Khomeini's return to Iran months after the Shah fled. Though analysts at the time did not anticipate him seizing power, the Islamic Republic was born just two months later. Analysts today say differences in Egypt's uprising and in the Brotherhood's following make a repeat unlikely. Qaradawi's following is nowhere near as deep or committed as was Khomeini's, said Ian Johnson, author of A Mosque in Munich, But his presence in Cairo complicates Egypt's fledgling move toward democracy. "Qaradawi has been a troubling specter in global Islam for the past couple of decades," Johnson said in an email. "He has taken some reformist positions but also advocates extremist, anti-democratic views. His injecting himself into the fragile Egyptian revolution cannot be helpful to that process." In an interview on National Public Radio, Stanford University director of Iranian studies Abbas Milani also said the Brotherhood has no charismatic leader of Khomeini's stature. But he remained skeptical of the organization's claims that it is not interested in making Egypt's revolution into an Islamic one. "Do you believe them?" asked Steve Inskeep. "No, I don't, to be honest with you," Milani said. "I think Muslim Brotherhood has an established record of wanting to create a government based on Sharia." The article said some call him a moderate. This should be more specific. I have found that religious scholar John Esposito and CAIR national director Nihad Awad have called him moderate. I suppose there are others.